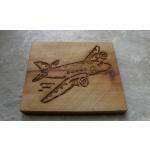 Laser engraved wood and ceramic tiles and trivets with custom engraved aviation designs. Aviation, Airplane, Helicopter, Military Aircraft, Jets, Planes and more. Aviation, Airplane, Helicopter, Military Aircraft, Jets, Planes and more.